Providing you the best range of two way tour guide system, museum guide system, audio guide system and wireless tour guide system with effective & timely delivery. Number of channels 23 independent channels. 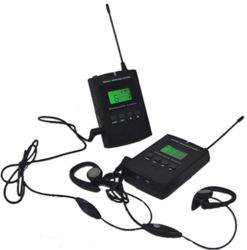 The two-way portable Wireless Audio Transceiver (WAT) WAT-01TW system consists of an audio transmitter and a set of transceivers. 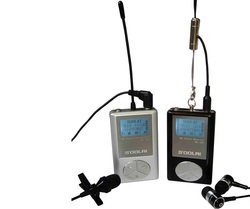 The guide can speak to the transmitter and visitors can hear from the receivers. When a visitor presses a button on the receiver, he can speak to the handset and all the others in the group will hear him. At the same time, the guide can still speak. It allows two people to speak at the same time and the people in one group can interact with each other. It is very good for factory tour guide. We also provide a earhanging receiver for this model. This earhanging receiver can only Receive sound, but not talking. This means, in a group, two guide can speak simultaneously and other people can use the earhanging receiver to listen to them. Two way transmission allows people in one group to interact. Allow two people to talk at the same time. Wider band allows crystal clear sound transmission. The ATGS-04 Museum Audio Guide System is a new Museum Audio Guide System. It is replacing our old ATGS02 audio guide system. The ATGS04 has a very ROBUST cover so that it is very resistant to damages. It has a simple structure, low cost and can meet most requirements from clients. 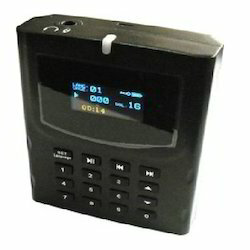 The visitor can manually activate the playing of contents by pushing the number keys on the handset. The audio files can be uploaded by USB cable. Limitless amount of handset device for each touring group. Slim and compact design, easy to carry. Rechargeable Lithium battery. 28-unit charging case is available. Easy to use ¨drop in multi-unit battery charger and micro USB charging jack. 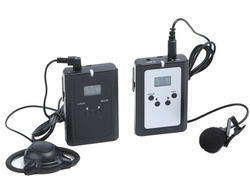 Our company is regarded as highly instrumental in offering a wide range of Wireless Tour Guide System. These high-grade quality communication systems are widely appreciated for their salient attributes such as durability, reliability and optimum performance. We offer these systems in tandem with the international quality standards. Safe, Light weighted environment-friendly Lithium Polymer Battery. High-performance double conversion superheterodyne - IF circuit.